When we got home late a couple of nights ago, it was freeeeezing. Not rainy (Vancouver miracle) but crisp and really cold, especially compared to our week of warm California sun. It’s amazing how the weather can change your food brain. I was planning on recreating some amazing salads that we had eaten, or maybe some of the more creative green juices, but my cold feet and nose had other plans. Warm spices and hot food in dutch ovens won over. 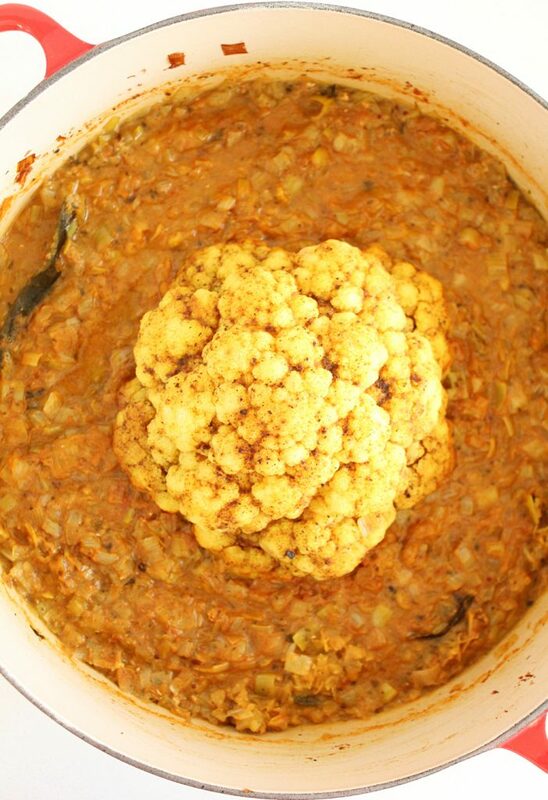 Who has tried roasting a cauliflower whole? 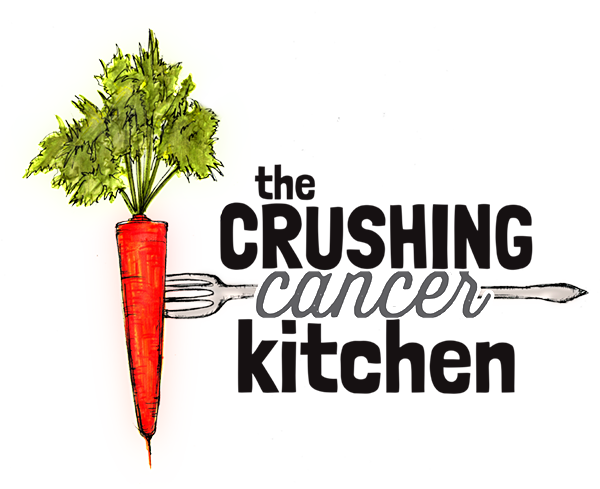 It’s a fun veggie trend that has been all over the internet for the last year or two. It’s fun, hearty, festive and obviously really healthy. The only down side is it takes a long time thanks to cauliflower’s dense, cabbage-y core. In this recipe, we don’t technically roast the cauliflower but sort of braise it or short poach it, I guess. 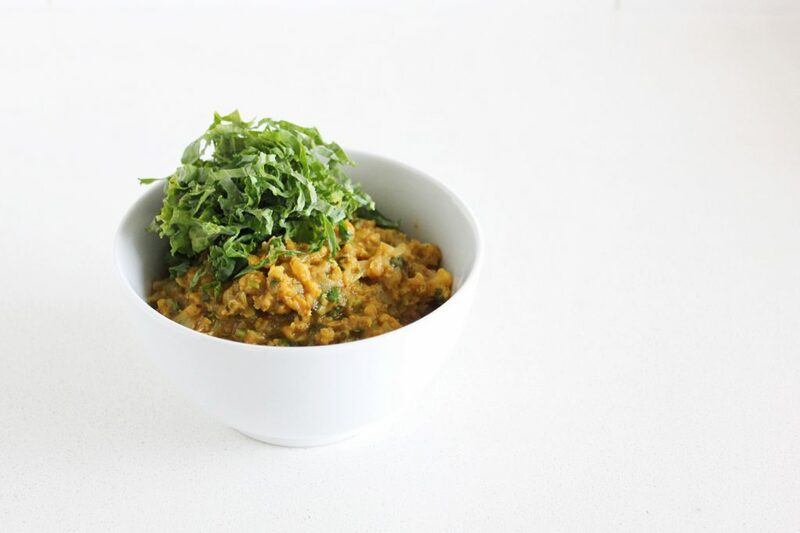 It sits on top of something liquidy (in this case a delicious lentil curry) and with the help of a tightly sealed lid, borrows the steam coming off of the lentils to speed up the cooking time and soften it up. 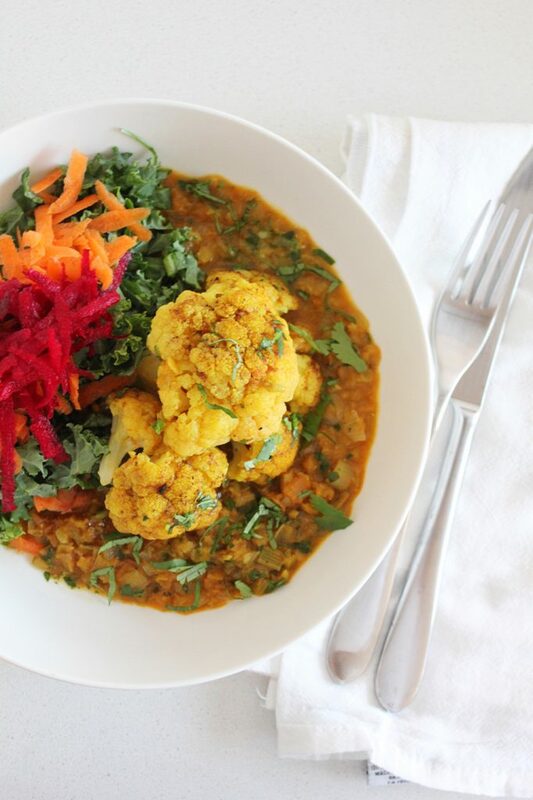 This means we don’t have to wait as long, the good stuff rubbed on the outside of the cauli isn’t exposed to the direct oven heat for as long, so it won’t singe (leaving the health properties and flavours fully intact) and it means we also get this delicious lentil dahl. The perfect one pot meal to warm your California-deprived body, if you ask me. 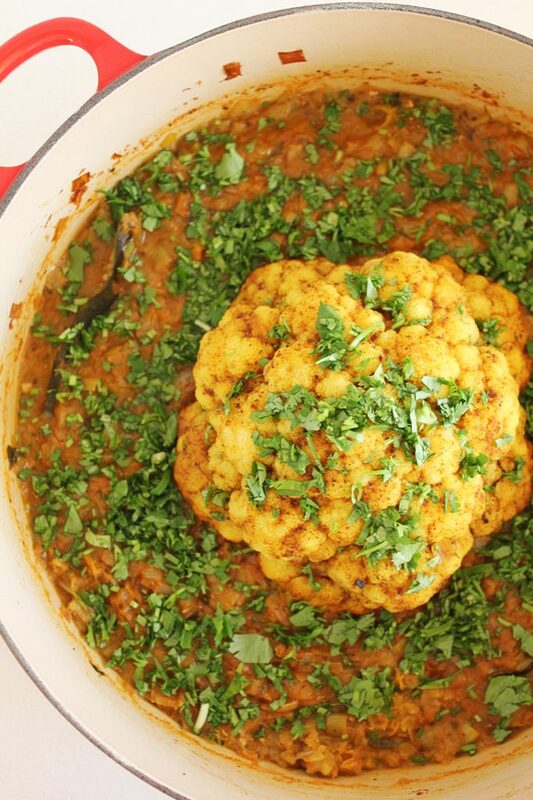 The lentil curry tastes awesome with the cauliflower but guess what else this saucy roasted/braised cauliflower concept works for? Your favourite TOMato sauce, any soup (like this Smoky Split Pea Soup), our insanely good Bagna Cauda (have you tried this yet?! ), Shakshuka base, or even our Millet Polenta. Just add the cauliflower head after the liquids have been brought to a boil, keep it on the shallow side so that you’re not actually submerging the cauliflower more than about a quarter of the way in, and then add a lid and bake the whole thing in the oven. Due to the warm, steamy and richly flavoured nature of this recipe, it tastes appropriate and wholesome to balance it out with some raw winter-y veggies like thinly sliced kale and grated beets and carrots, fresh radishes, Fermented Veggies, some Coconut Yoghurt or just a whole lot of freshly chopped cilantro and a squeeze of lemon juice. 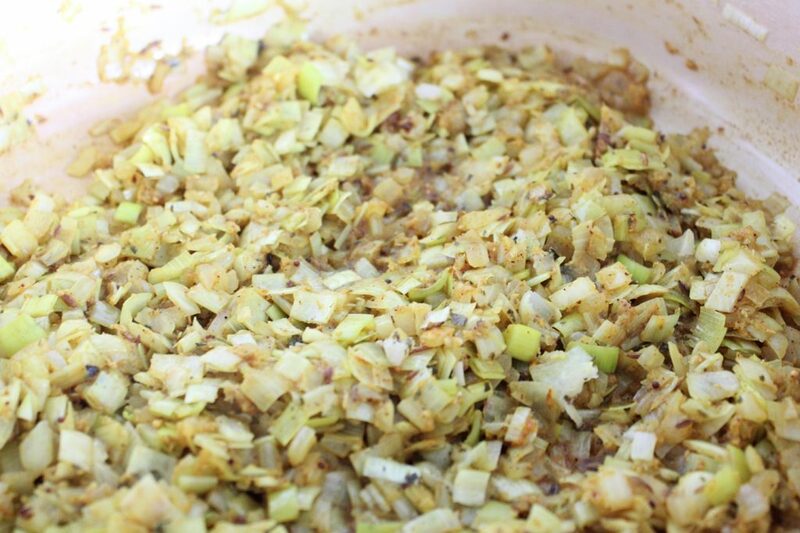 It would also go extremely well with this Winter-y Cabbage salad. In case you would prefer to pretend you were in San Francisco with me (I don’t blame you), bookmark this recipe for a chilly day and check out this Grapefruit, Avocado & Jicama Salad. It’s all there, without the hills. On med/low heat in a heavy bottomed pot with a lid (dutch oven would be best), in the coconut oil with a splash of water, sweat the onion, garlic, leek and ginger until softened and translucent. Add the spices and continue to sauté for another minute. 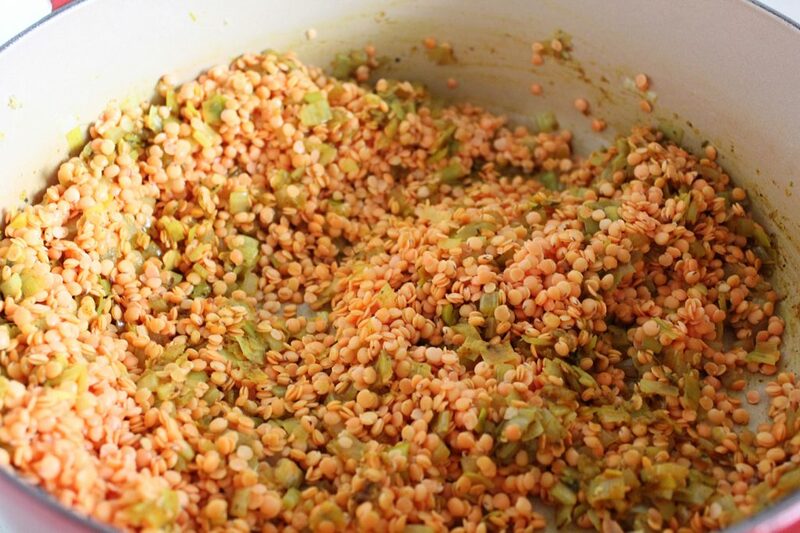 Add the lentils, water, tomato, coconut milk and kombu and bring to a boil. 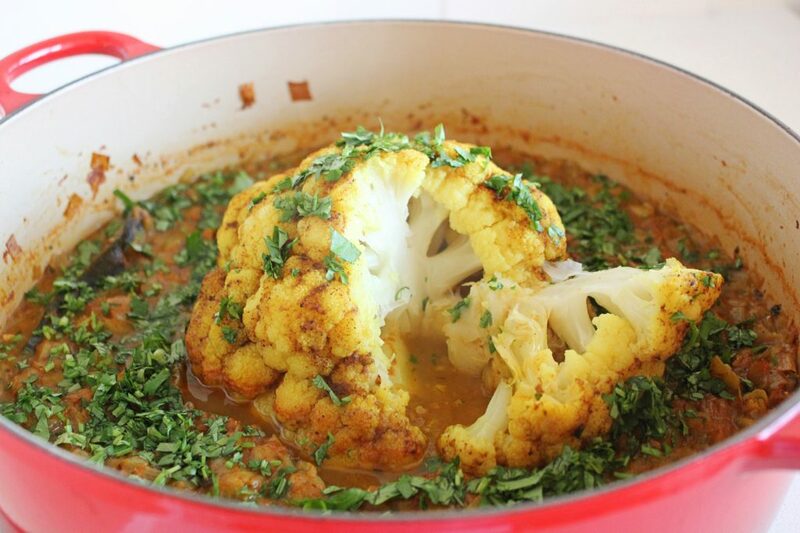 Place the spice-rubbed cauliflower (see below) in the middle of the curry, turn off the heat and put the lid (or foil) on top. 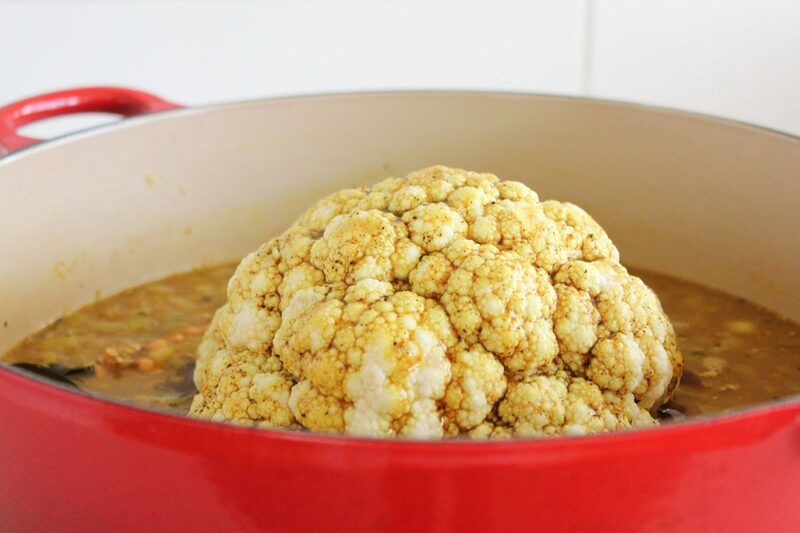 Put the entire pot in the oven and bake for 30-40 minutes or until the cauliflower is tender. Take the lid off, squeeze some fresh lemon juice over top and sprinkle on the chopped cilantro. 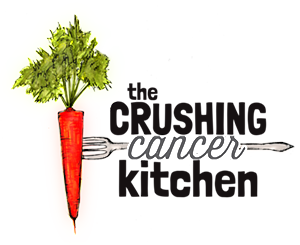 Serve with chopped fresh kale, grated carrots and beets, fermented veggies or just as is. Trim the bottom little bit off of the cauliflower (leave the greens on if they look good). 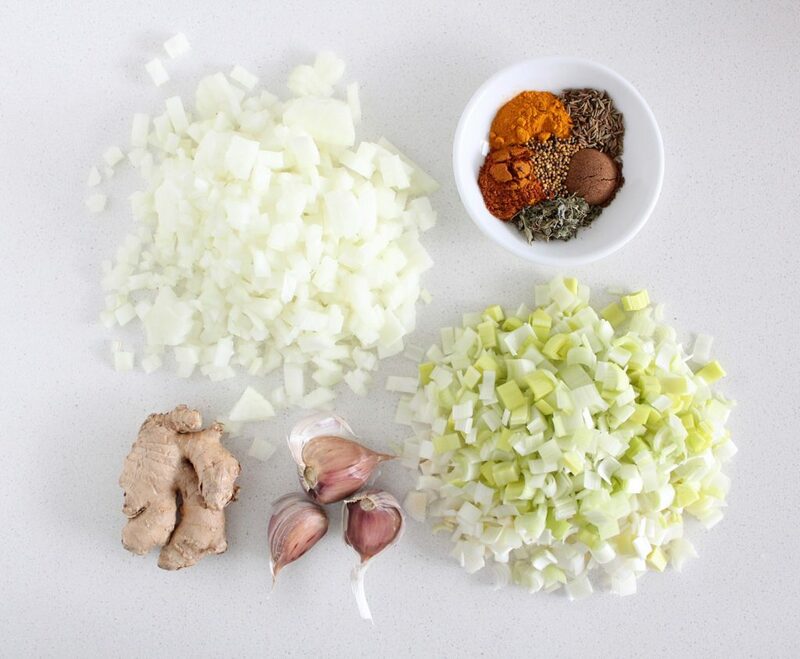 Melt the coconut oil together with the spices, s&p. Pour it over top of the cauliflower and rub it all over. Place in the middle of the curry pot (see above) and continue with the recipe above.